It is now the time of the summer interlude, and with it, stopovers in the permanent vortex of our daily work. Take the opportunity to “open new eyes” on us, on the others, the new meetings that we have not yet made, they are just more exciting. Let’s flee the “doomsayers”, all hair barkers, “declinists” who live like flatterers, ”at the expense of those who listen”. Europe, recently celebrated 70 years of Peace after 35 years of war (1914-1918, 1939-1945): is not this fantastic! So yes, let’s make happiness stopovers big or small, whatever, look at a landscape, an object created by the hand of man, a smile, that’s also the daily life. And as to thank those who gave their blood for this beautiful idea of Europe: solidarity between people has never been greater. So yes it’s hard, yes it is sometimes unfair, yes the world of “Care Bears” does not exist, but we also knew it, right ? But to claim that the withdrawal is protective is a lie, it is the exact opposite. For almost 10 years ( 2015!) 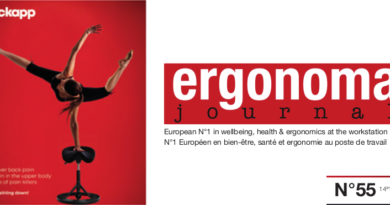 Ergonoma Journal has invited you over its editorials, to discover specific cases of listening to others, solidarity, integration of differences, and where: ? IN EUROPE, then yes, take the time to make stopovers. All the Ergonoma Journal team, editors, commercial service, and faithful providers wish you a great parenthesis.